Jewelry has never been just for women, but there seems to be a growing trend that has made the market for men’s jewelry bigger and better than ever! There are so many wonderful choices out there that there is definitely something amazing for any and every man. If you are searching for the perfect ring for your other half, you definitely need to check out this list where we have compiled the best men’s rings! At the very top of our list is this incredible ring from the amazing brand, King Will. This is an extremely refined, sophisticated, and masculine ring. It is made primarily from tungsten carbide, so it is very durable and tough. The tungsten carbide of this ring is a very uncommon and stunning brown color. It has a matte, brushed finish to further add to the masculinity and sophisticated look of this ring. It is a band-style ring that is 8mm in width all the way around the ring. The edges of the ring are beveled for a more finished appearance. It is available in nearly 20 different sizes! These sizes range from 6 all the way to 15 and include many half sizes as well. For a very special, refined touch, there is groove right down the center of the ring filled with rose gold. It creates a truly beautiful and soft touch. 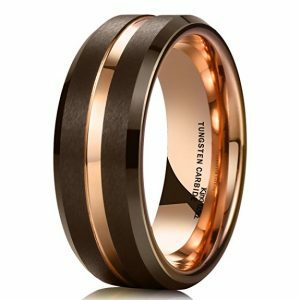 The color of the rose gold and the brown of the tungsten carbide go together perfectly. The inside of the ring is also in the rose gold with a high-polish to add to it’s comfort-fit design. The ring is slightly rounded rather than flat on the inside to increase comfort of the wearer. To top it all off, this awesome ring comes in a fantastic little box to keep the ring safe and present it in a special way. It is a gorgeous ring that is almost guaranteed to be loved and appreciated by the man in your life. It makes a great choice for a variety of occasions. It can even make a great wedding ring! Here is a lovely, high-quality, and classic men’s ring from Seta Jewelry. It consists of yellow gold and real diamonds, which is exactly how it achieves that beautiful, classic look. It has a band-design that is wider at the top than it is the bottom. The ring is made primarily of 10k yellow gold. It also includes the 10k stamp for gold quality. The ring is available in 4 different sizes ranging from 9 to 13. In the center of this men’s ring, there is a single row of stunning little diamonds. This row of small diamonds stretches across the ring diagonally. There is a total of 9 individual diamonds spanning across the ring. The diamonds near the center of the row are slightly larger than the diamonds that are nearer to the edges of the row. In total, there is about 1/8 of diamonds on this gorgeous, gold, men’s ring. The gold right around the row of diamonds has a very cool rippling affect coming out from where the diamonds are in the ring. This adds a very nice touch of brilliant detail to the overall look of the ring. This is a seriously awesome men’s ring with tons of great value to it. It is also very versatile as it can serve multiple purposes from a simple fashion statement to something as important and sentimental as a men’s wedding ring. 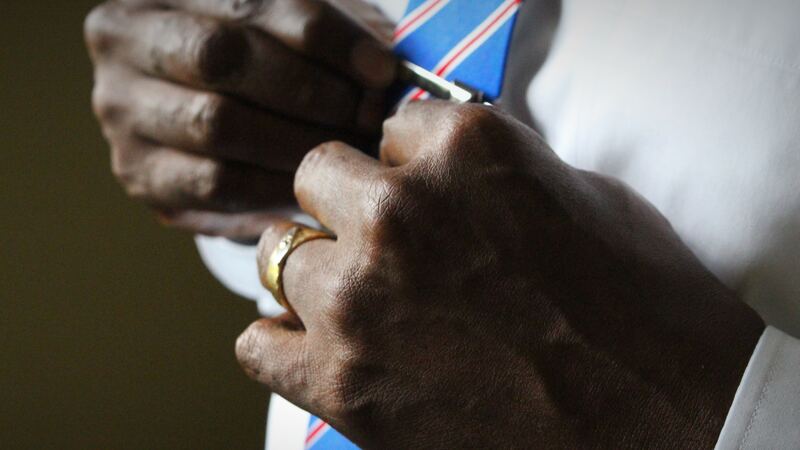 Whatever this ring is meant for, it is sure to be well-loved by the man wearing it. 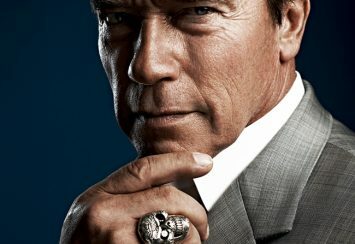 Now here is a super cool men’s ring! This ring is extremely unique and very modern. Silicone rings are a fairly new thing that are quickly gaining popularity today. They have tons of great benefits like being lightweight, super comfortable, extremely durable, stylish, and even affordable! This isn’t just any silicone ring though, this is one very special silicone ring. Silicone rings, in and of themselves, are unique among other rings, but this ring is unique even among other silicone rings. 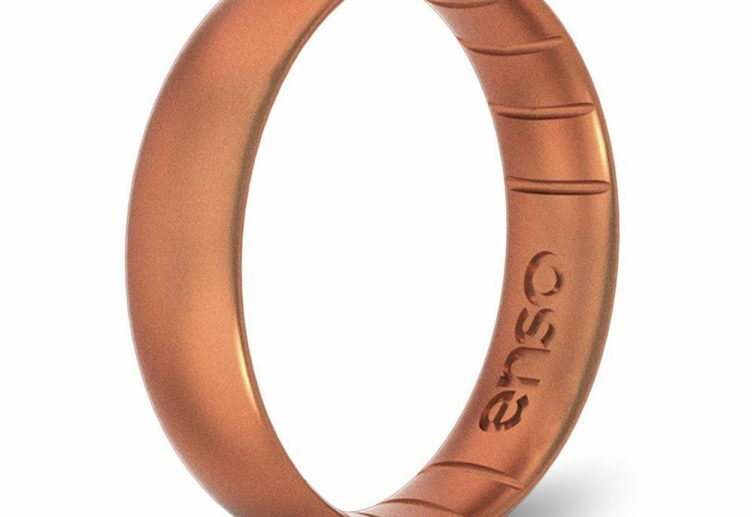 What makes this silicone ring so special is that it is infused with precious metals! That way you can get the best of both worlds! You get this amazing, durable, lightweight, affordable silicone ring, but it still has the gorgeous appearance and value that come along with rings made of precious metals because it has precious metal infused right into the silicone that it is created with! Another cool thing is that they have several different options of precious metals that you can get this ring in. This ring comes in copper, black pearl, yellow gold, and rose gold! With these options, you are sure to find the perfect ring for your man. This particular ring is actually a unisex option, so you could even get one to match with your man if you wanted to. This ring can be a great gift for any type of occasion. 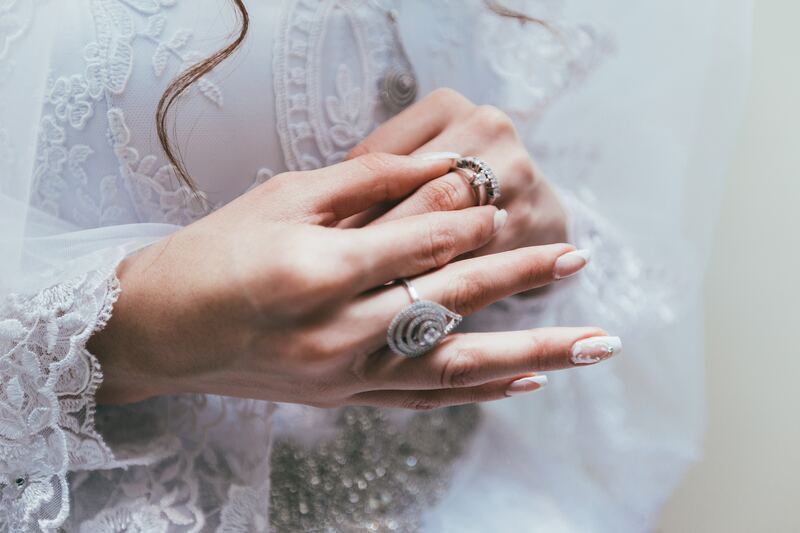 Some couples will buy these rings as an alternative to their wedding rings when they are doing more strenuous or risky activities, but some people even just choose to have these as their full-time wedding rings. With their gorgeous appearance, high value, and unbeatable comfort, it totally makes sense! From i Wedding Band comes this amazing 14k gold ring. Now, this ring is your truly classic men’s wedding band. 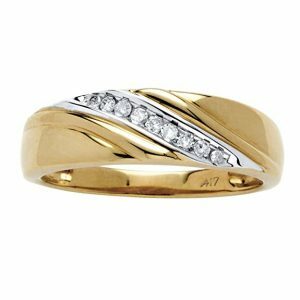 It is made of solid 14k yellow gold and is a simple, yet very sophisticated plain band ring. This ring has a timeless look that really makes a perfect men’s ring. The ring is 5mm in width which gives a nice, masculine look without becoming overbearing. The thickness of the ring is 1.3mm which is on the thinner side, but for good reason. This ring being slightly thinner does not do much to affect the look of the ring, but it cuts down on the weight of the ring. This adds some extra comfort to it. To further add to the comfort of the ring, it has what is called comfort-fit design. That means that the inside of the ring is rounded slightly to provide a comfortable fit that allows your finger to move more freely when you are wearing the ring. This ring is made in the USA and comes with a certificate of authenticity from i Wedding Band. It is made using something called a Computer Numerical Control, or CNC, machine. The machine uses a continuous tube of the 14k yellow gold in order to create a seamless ring that is flawless, every time. 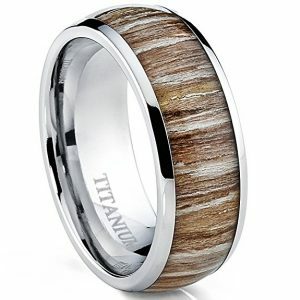 This is a great wedding band for a man with a strong, simple style! If you are looking for something that is really special for the man in your life, this is definitely a great ring. It is super high-quality and has a very nice, unique, and high-end design. The ring is made of genuine, solid tungsten carbide. That means that it is super strong and durable. It also means that the ring is scratchproof as well as hypoallergenic. It is available in a wide range of sizes starting at a 4 and going all the way up to 14 and even comes in half sizes for an even better fit. This ring is 8mm wide and has several sections across it. There are three individual grooves cut into the tungsten carbide. The center groove has a gorgeous inlay of abalone shell pieces. 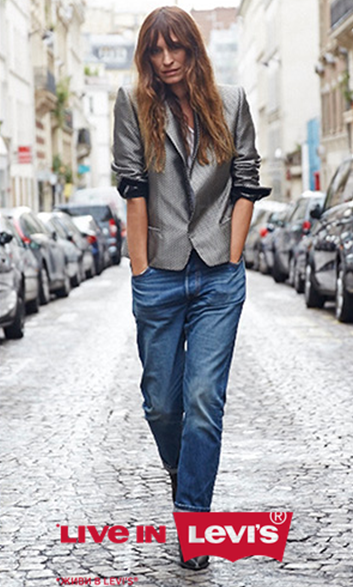 This creates a textured look that is very shiny. 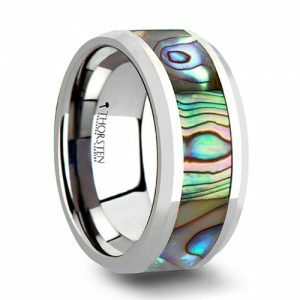 Since it is real abalone shell, the colors vary slightly from ring to ring, but in general it has a blue/green appearance. The two outer grooves are then inlayed with real Hawaiian Koa wood. This beautiful wood goes very well with the abalone shell pieces. 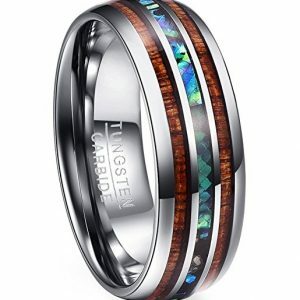 The tungsten carbide that makes up the majority of this amazing men’s ring has a silver finish to it which makes a fantastic base for the Koa wood and abalone shell. It has a high-polish finish to increase both shine and comfort. 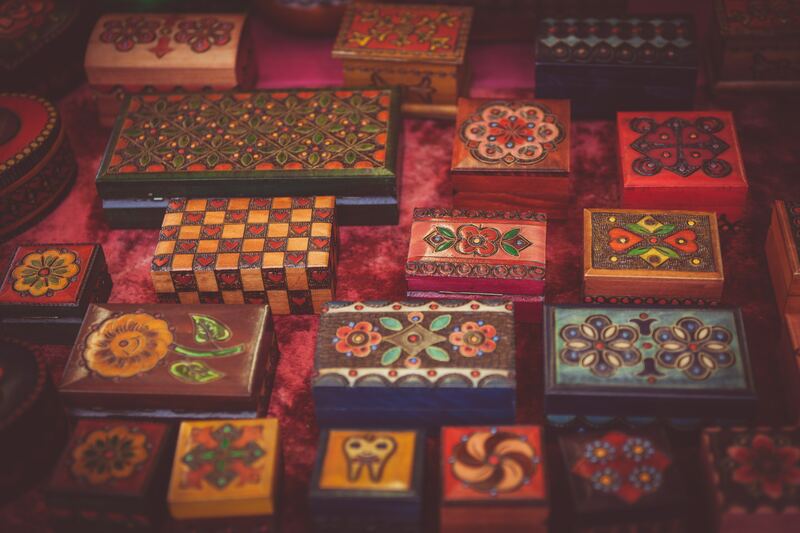 It even comes in a lovely little ring box making it a perfect gift and givies you somewhere to store the ring anytime it isn’t being worn. If you think your man would want a very masculine choice that is also detailed and complex, this is the absolute perfect ring for him! The second silicone ring option on our list is from Arua. 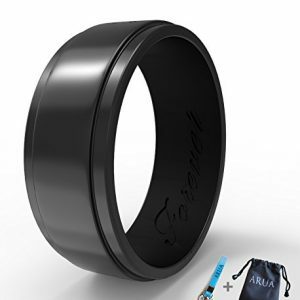 This silicone men’s ring is a bit wider than the other choice on the list for an even more masculine look. It is 8mm wide. Even though the ring is nice and wide for a bold, masculine appearance, it isn’t super thick like many metal rings. This ring is thin to keep the wearer as comfortable as possible by not restricting movement or adding a lot of weight. It comes in sizes 8 through 13 so that it will easily fit most men. This awesome silicone ring is also available in 3 different colors, so that you can choose the best one for your man. The available colors are black, grey, and navy blue. The way this silicone ring is designed makes it look nearly identical to an actual metal ring. The edges are beveled, and the finish is very shiny just like real metal. It has the many benefits of silicone such as its superior durability and affordability. It is also safer as it won’t cause damage to your belongings and it won’t cause damage or pain or discomfort to your hand, even when doing things like weightlifting, rock climbing, or any other more strenuous activities. This silicone ring has a fantastic value all on its own, but the company didn’t stop there. To increase the value even more, they decided to include two different free gifts with the purchase of one of these great rings. The first thing that they include is a small drawstring bag to give you a great place to store either your silicone ring or a different ring that you may be using your silicone ring to replace. They also include a very nifty little keychain that you can hook your ring onto for even more convenient storage. Here is another amazing men’s ring from King Will. King Will is a truly impressive brand with tons of beautiful rings like the ones on this list. This gorgeous option is very sophisticated and elegant. It is made of very strong tungsten carbide. That means that it is scratch-resistant, durable, and has a nice weight to it. It is designed with a comfort fit meaning that the inside of the ring has a slight curve to it. This gives your finger more room to move around comfortably while wearing the ring. The tungsten carbide is also brushed for a very nice matte finish. There is a groove cut into the ring that is slightly off center. The groove is filled with rose gold which matches the rose gold interior of the ring as well. On the smaller side of the ring, the tungsten carbide has a silver finish. On the larger side of the ring, the tungsten carbide has a black finish. These two different finishes go very well together, especially broken up by the rose gold. 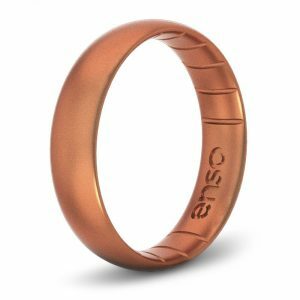 The placement of the rose gold groove gives a very nice and modern, asymmetrical design to the ring. The inner part of the ring, which is also rose gold, has a high-polish finish for increased shine and comfort when wearing. This tungsten carbide ring is 8mm wide and comes in a large variety of sizes that ranges from sizes as small as 6 all the way up to a size 15. This means it should fit almost every finger, especially since it is also available in half sizes. It comes with a King Will ring box to enhance its value as a gift as well as to give a good place to store the ring anytime that it isn’t being worn. This elegant, modern, and sophisticated ring can be a wonderful choice for almost any purpose including as a wedding ring. One more very cool choice from King Will is this awesome Lord of the Rings band ring. This ring is modeled after the famous ring from Lord of the Rings known as the One Ring. So, it is a perfect gift choice for any fan of Lord of the Rings. The ring is made out of titanium that is strong and durable and then it is plated in stunning gold. It is 7mm wide and comes in sizes 6 through 15, including half sizes for a great fit. This is another one of King Will’s awesome rings with the comfort fit design. That means that the inside center of the ring is curved slightly to maximize potential comfort of the wearer by increasing the finger’s ability to easily move in the ring. The ring also has the high-polish finish that further adds to the overall comfort of the ring as well as increases the shine of it, too. This ring may not have actual magical properties, but just like the fictional One Ring, this ring has engraving on the inside and outside of the ring. 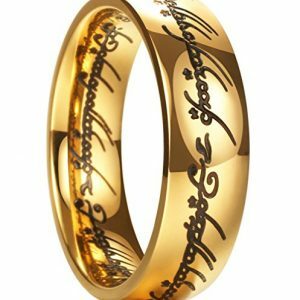 The engraving is elvish writing that when translated to English reads, “One ring to rule them all, one ring to find them, one ring to bring them all and in the darkness bind them.” Don’t worry, even if that doesn’t make any sense to you, your other half will absolutely get it if he is a Lord of the Rings fan! This is a wonderful ring that may be especially good for the more outdoorsy type of man. It is made of strong, attractive-looking titanium that is solid and genuine for good durability and style. The main feature of this great men’s ring is the beautiful, real wood that is inlaid in a wide groove that goes around the entire ring. Similar rings may simply have a sticker made to look like wood, but this ring has real wood in it. This is another ring that has the awesome comfort fit design, meaning that the inner part of the ring has a little bit of a curve to it, which allows for more free movement of the finger and therefore better overall comfort. The ring is 8mm which is a nice, wide size that provides a nice touch of masculinity and makes the details of the wood very visible. A free ring box is also included with this amazing titanium men’s ring. The box is a simple black ring box that will make it an even better gift. It is available in an impressive number of different sizes ranging from size 6 all the way up to size 15, including half sizes for the best possible fit. This is a great ring that can be given as a gift for every occasion. It has a super nice, rustic, outdoorsy feel. 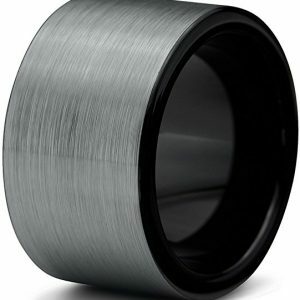 For a super bold look, this amazing tungsten carbide men’s ring is the absolute perfect choice. This ring is very bold while remaining wonderfully simple. It is made of tungsten carbide that is super tough and scratch-resistant. As a bonus, tungsten carbide is also hypoallergenic. The tungsten carbide is a silver color and has a satin, brushed finish for a very nice, high-end appearance. On the inside of the ring, black enamel is perfectly placed and designed to rest against your finger. The enamel is designed to have a curve in it to create the comfort fit design that allows easy movement and less restriction of the finger that the ring is on. This definitely increases the overall comfort, as does the silky-smooth surface of the enamel. The enamel that makes the inside of the ring is black, which goes perfectly with the brushed silver finish on the outside of the ring. One of the coolest things about this particular ring that makes it really stand out and creates that super bold look is how wide the ring is. Most men’s rings are around 7-8mm, but this ring is a whopping 12mm wide! This really makes it stand out and catch the eye. It enhances the masculinity of the ring and adds a unique touch. The man in your life is sure to love this ring, no matter what the reason you get it for him is. This could really make a wonderful choice for men with larger hands! 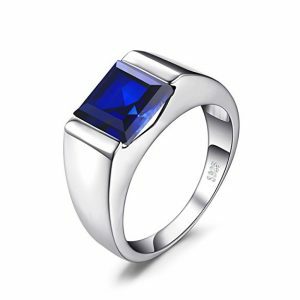 This is a more casual men’s ring from INBLUE. It isn’t super fancy, but it is still very cool and a great gift for your other half! 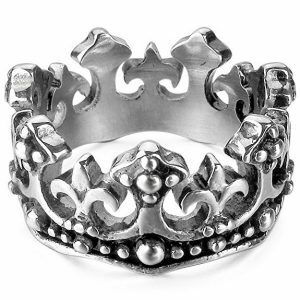 This ring is shaped like a crown. It is made of stainless steel, so you don’t need to worry about tarnishing or your man’s finger turning colors when it is worn. In addition to the silver appearance of the stainless steel, this ring has a very cool antiqued look added to it with a small amount of black dispersed specifically in the crevices of the design. The detailing of this ring is truly beautiful. The bottom of the crown has small curves around the edges, and the top of the crown has alternating low and high points. Each low point of the crown is shaped like a fleur de lis and each of the high points on the crown is shaped like a cross. In addition to the low and high points, there is a groove that runs around the ring near the bottom of the crown that raised dots that are three different sizes and placed in a lovely pattern, too. 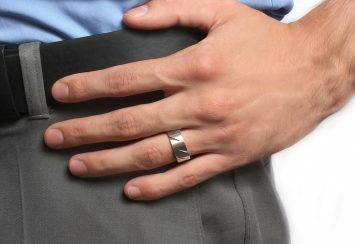 Available in sizes from 7 to 15, this is a ring that should easily fit most men’s fingers. At it’s widest point, it is just barely under an inch wide, so it has a nice size to it that is wide enough to see detail clearly without being so wide that it is overbearing. This is a lovely and affordable ring that would make the perfect gift to the man in your life. It is a great way to show him what a king you think he is! 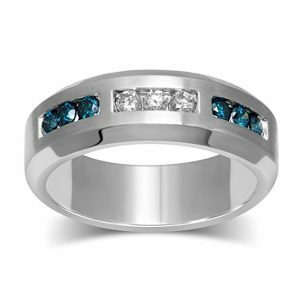 Diamond Jewel brings us this stunningly gorgeous diamond men’s ring. This ring is beautiful and modern as well as simple and masculine. It is made of lovely sterling silver that gives it a gorgeous look while keeping the cost down a little. The ring has deeply beveled edges that add to the sleek, modern design. The inside of the ring is not designed with the comfort fit curve that many of the other rings on the list have, but it is a little less wide than the rings that do have it, so it should not restrict movement and cause discomfort because of this. Along the center of the top of the ring, there are three individual rectangles cut out of the ring. Each rectangle is an equal distance apart and the same size as the others. Each one of these rectangular cut-outs is also filled with gorgeous real diamonds! Each rectangle has three individual diamonds in it. The rectangle in the middle is filled with natural white diamonds and the two rectangles on either side of the center are filled with beautiful blue diamonds that add the perfect colorful touch to the silver and white diamonds. This brand offers EXACT-SIZE, EXACT-FIT, which means that rather than choosing a ring size, you choose the size of your actual finger. This means that you will get the exact perfect size for you to ensure comfort and usability. The ring also comes with a free white leatherette box! It is a very lovely gift for any man and can be good for anything special, even as a super cool, sleek, modern wedding ring! This is an extremely valuable and beautiful men’s ring! It is made of tungsten carbide that is durable, scratch-resistant, and hypoallergenic. 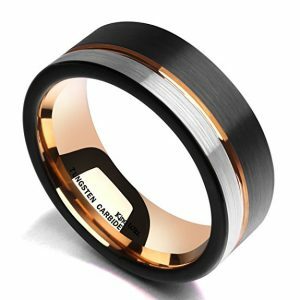 The tungsten carbide is a silver color with a high-polish finish and there is a wide groove that goes all around the ring. Inside that groove, stunning mother of pearl is inlaid for a gorgeous, detailed design that is primarily blue-green in color. This company gives you a fantastic value by offering a lifetime warranty, and free lifetime sizing. That way if you ever lose or gain weight, they will change the size of your ring for free to ensure you always get a great fit! One of the very coolest things about this ring is that it comes with free laser engraving! The company will engrave the ring for free with whatever you want. You can even add several different symbols and choose your font! The sizes this ring is available in are sizes 5-14, so it should easily fit most men. The wide variety of sizes, breathtaking appearance, and high-quality make this a perfect gift for any man! The free engraving gives you the opportunity to easily make this an even more special and personalized gift for the special man in your life. 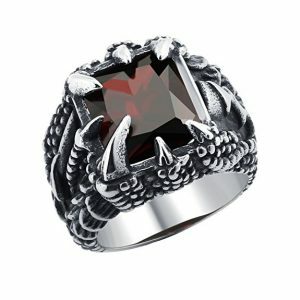 Here is the perfect men’s ring for the fantasy lovers out there! This super cool and bold ring is designed to look like dragon claws holding a beautiful crystal in place. 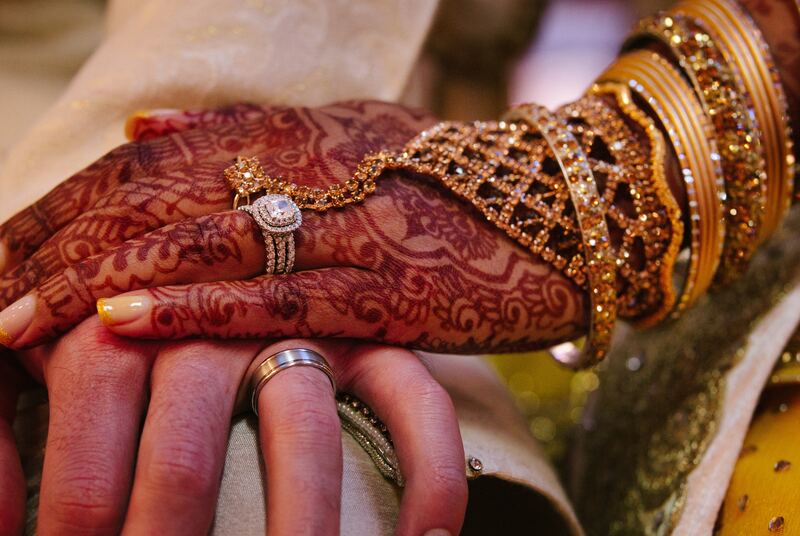 The ring is made of stainless steel, so that it never tarnishes or changes the color of skin. The ring is amazingly detailed and appears to be adorned in dragon scales. The ring also has an awesome tarnished look to it with black in the crevices. This further highlights the details of the ring and adds to the overall fantastical look. Rather than your typical prongs, metal dragon claws rise out of the ring to hold in a gorgeous stone. The stone is artificial crystal and is available in several different colors. You can choose black, red, a dark blue color, or a sky-blue color. This way you can pick the color that you know your man will love the best. It is available in sizes 8-12, so it may not fit men with much larger or much smaller hands, but it will accommodate the most common sizes for men. This ring isn’t exactly anything fancy and it probably won’t qualify as a wedding ring for most couples, but it is a super cool ring that makes a great gift for other occasions like birthdays, holidays, or anniversaries! If this is the kind of thing that your significant other is into, this will make a really special gift that he will be super excited to wear and know that you recognize and appreciate his interests. 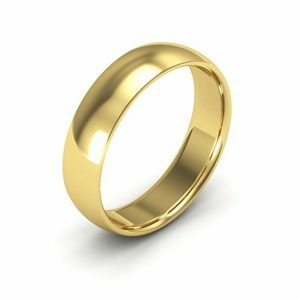 If you are looking for a men’s ring that is quite nice, but still simple and affordable, this is your ring. It is a lovely men’s ring with a very minimalistic design to it. The ring is made of 925 sterling silver and is also plated with rhodium for a brilliant shining finish that will last and last. 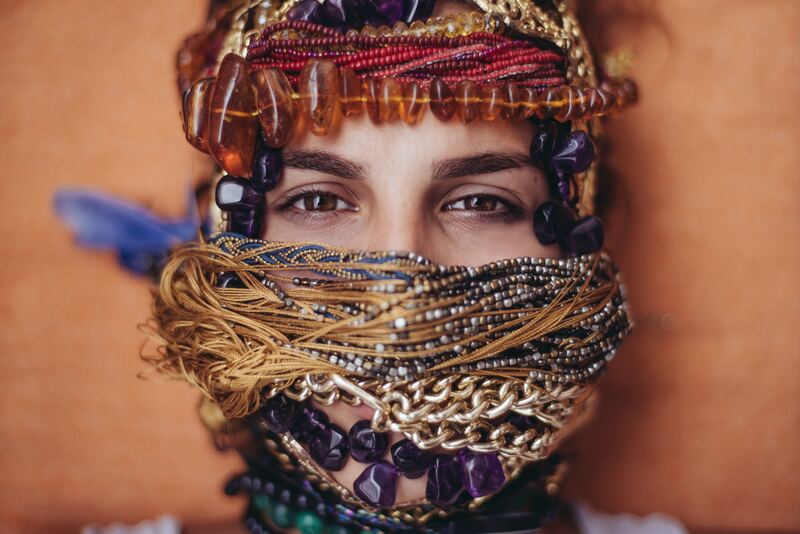 What is really special is that this is a piece of handcrafted jewelry meaning that each one is created with careful patience as a piece of artwork. The large blue sapphire that adorns this ring is both bold and masculine. It is a created genuine blue sapphire with stunning beauty. The blue sapphire is cut into a very sharp and precise square that further enhances the masculine features of the ring. It also gives it a minimalistic, modern look as well. The band of the ring is thinner at the bottom than it is the top which helps to accentuate the sapphire even more. The widest point of the ring is 8mm across, which is a great size for a men’s ring. It is also the perfect size to adequately house the 3.4 CT blue sapphire. This is really an amazing men’s ring that won’t break the bank. It is simple, yet high-quality. This is a ring that really will make a wonderful gift for almost any man for almost any occasion. 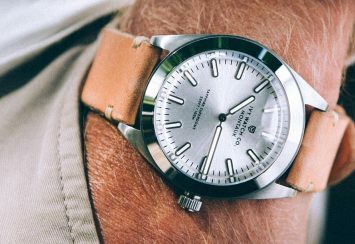 Inspiration Men’s Luxury Watches? Our 10 Favorite Picks!